In the winter of 2009 my friend, Joanna Rees, and I were exploring a very step rugged canyon on a part of the ranch named “High Lonesome.” We entered the canyon from the bottom climbing through thick brush, fallen trees, over rocks and stones. I was there primarily looking for any new source of water, a seep or spring, but we were also exploring, enjoying the Fall colors and getting good exercise. I hadn’t been in this canyon in years. It was thick with greenbriar which we were fighting and cutting on our way. At the head of the canyon rim it is lined with an outcropping of giant boulders, perhaps 20 feet tall. We could see where wild creatures had made their homes there. Perhaps coyotes, bobcats, maybe even our goats who are pastured there from time to time, but what got our attention were strange drawings on the face of these giant boulders. There were many of them and at first we thought – PETROGLYPHS. This was exciting as perhaps it would be another attraction for our education programs. We’re pretty excited about this and I can’t wait to show this to Steven. Upon looking at these interesting circles, Steven said these are not ancient Indian messages at all, but are in fact lichens. Not ancient, but they are formed over very long periods of time. We have, over 40 years, been “building” a library here at the ranch. Not just field guides, but published research, and books on everything that exist with us and for us on this planet. Books on nature’s success stories, famous explorers who wrote about the Hill Country and modern day biologists and environmentalists. Books on endangered species and legal issues. Books on water, trees, grass, fossils – well you name it – we have a respectable library . . . but it had never occurred to me to acquire a book on lichens until my curiosity arose from the discovery of the “petroglyphs”! I learned about the “lichen bible” as I call it – Lichens of North America by Irwin M. Brodd, Sylvia Duran Sharnoff and Stepehn Sharnoff published by Yale University Press. It’s unbelievably thorough and beautiful. It also is big and thick and it cost over $120.00! I also found in our library an article about lichens by Janet R. Edwards and printed in the Texas Co-op Power Magazine in September of 2001. I also got lichen information from my good friend Susan Sander, founder of the Riverside Nature Center in Kerrville. She is always full of nature knowledge. . . . One of the more unusual lichen things I received was through a Selah visitor, Gwendolyn Hallsmith, from Montpelier, Vermont. She, via email, introduced me to Alan Atkisson who wrote, among other things, “The Strangely Popular Lichen Song” which, with his permission, I’m adding the lyrics to this posting . . . You can buy the song on iTunes or on Amazon.com. Now, just what are lichens? Once again, I have to confess – I’m not a biologist so I won’t try to get into the scientific lingo by copying from my Lichen bible – about the simplest way I can define a lichen is that they are small, colorful little creatures. They are not plants, but they grow or form just about everywhere in any environment from deserts to the Artic, on trees or stone, iron gates, power lines or dead wood. They are formed from a marriage of an alga and a fungus and like in any marriage (should be) they work together for the benefit of both. Lichens are different than mosses, fungi or algae, but I don’t have the ability to tell you about all their differences except that a mushroom is a fungus, mosses are small soft plants that, here on the ranch, grow on stones around our springs and as the adage goes “a rolling stone gathers no moss” and fungi are a group of spore-producing organisms feeding on organic matter such as molds, yeast, mushrooms and toadstools. I read once in a government agriculture bulletin that it takes Mother Nature 500 years to manufacture soil. Well, it’s lichens that make this happen! One more fact before I move on, is that lichens are useful in making compounds used in medicines as well as herbicides, dyes and perfumes and if you’re poking around in bird nests, you’ll often find the birds used them in building the nests. So, you see, lichens are another of nature’s success stories! Steven left me a post-a-note in the lichen bible instructing me to “find this in a tree.” It’s the 9 x 10 beautiful picture on the jacket cover of my lichen bible. I thought that should be so easy to spot until I walked trails and woods for two hours to no avail. You’d think an 82 year-old conservation oriented man like me would know better. When I complained to Steven, he reached to a branch over my head – he’s 6’8” – and broke off this dead branch. I had been wondering through the woods looking for a big patch of this orange beauty, not something the size of a nickel! Photograph taken by Lois Sturm. Psora crenata (From the Lichen bible) Common name – Brickscale. Found on soil in arid sites. The scales are pink to pinkish-orange and turn grey-green when damp. They are very small. Photograph taken by J. David. Here is Steven looking at the petroglyphs!! Well, not petroglyphs, but you can imagine how excited we were when we found them. The Lichen “bible” lists them as Speerchneidera euploca with a common name, Pale rockwood. Photograph taken by J. David. Here you see a large group of the Pale rockwood. A common growth form of lichens is in circular patches or radial growth. 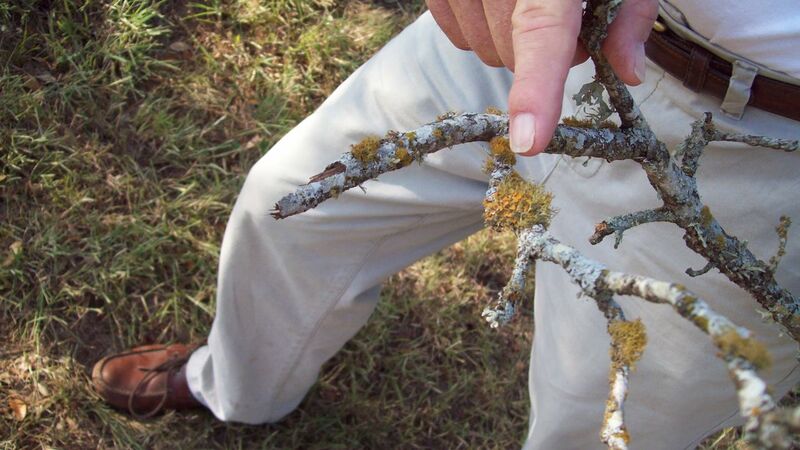 Some lichens will maintain the entire patch of growth while others will allow the older center of the patch to become inactive and die leaving an outer ring of younger material which continues to take advantage of un-harvested nutrients/minerals from the substrate as it grows in a radial fashion. Photograph taken by J. David. Dermatocarpon miniatum – common name Stippleback, leather lichen. Lichens have the ability to grow on rocks of all types and textures. These are usually found on limestone rock. Photograph taken by J. David. The following are three pictures of lichen covered rock. Our hillsides on the ranch have many large rocks covered with the white patches – Hacma fenzlianum. We found very little of the yellow and orange. All photographs by J. David. Disclaimer! Many times I’ve said I’m not a scientist. This is the most difficult blog I’ve ever tried and I might not have these lichens correctly identified. I will say I know much more now about lichens than I did before. Discovery and pictures were the easy part, the identification was not. But Alice said, “Now Freddy, there’s something else we need. And take vows of symbiosis, you can be a lichen too! There are so many, many good causes that need financial help. Preserving the earth itself is important. So, if you would like to help us with a donation, we are a 501(c)3 private operating foundation and gifts are deductible to the extent of the law. You can send your contributions to: Bamberger Ranch Preserve, 2341 Blue Ridge Drive, Johnson City, TX 78636 or donate through your computer by using PayPal.